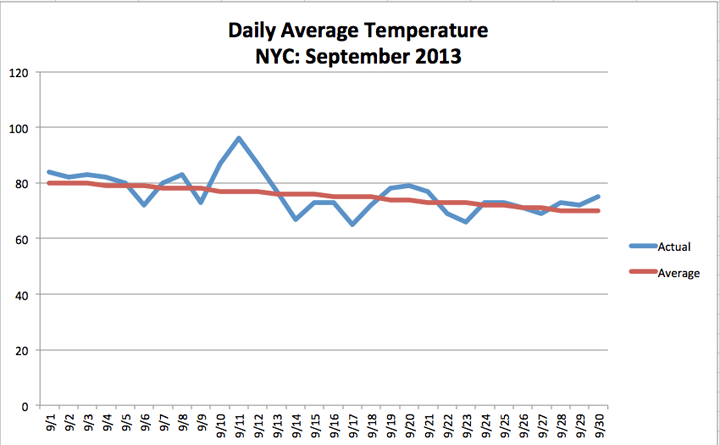 September 2013 was a bit of a weather roller coaster in New York City. We had high temperatures that ranged from a sweltering 96°F to a cool 65°F. All together, though, the city’s average monthly temperature was 68°F, which is exactly normal. Transitioning from summer to autumn, these wide fluctuations are not that unusual. In terms of precipitation, the city was mostly dry. We received 2.95 inches of rain in Central Park, most of which fell during two separate heavy downpours. Nonetheless, we were still 1.33 inches below normal. September now marks the third consecutive month that the city received below average rainfall. This entry was posted in weather and tagged autumn, nyc, stats by Melissa Fleming. Bookmark the permalink.